The Romance Dish: Victoria Alexander Giveaway! Have you ever wanted to have a cozy chat with a #1 New York Times Bestselling author? 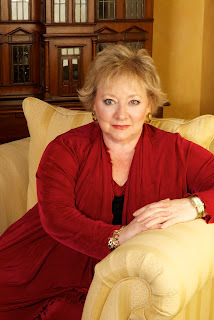 Bubbling over with questions for a woman who has written more than 25 romance novels since 1995, regularly hits the bestseller lists and has created some of readers' favorite romance characters? Well, here's your chance! On Tuesday, November 6 at 6pm PST / 9pm EST, Author Marketing Experts is hosting a Google+ hangout live chat event with historical romance author Victoria Alexander and you could win a virtual seat at the event! We've reserved the seat and one of you lucky readers will be randomly chosen to occupy it. Never used Google+ hangouts? Don't worry, it's easy. If you already have a Google ID or GMail account, you're already set up to activate Google+. If you need to open a Google account, follow the instructions here. Here's more info on using Google+ hangouts. If you use Skype, you should have no problem using hangouts. Not the lucky seat winner? 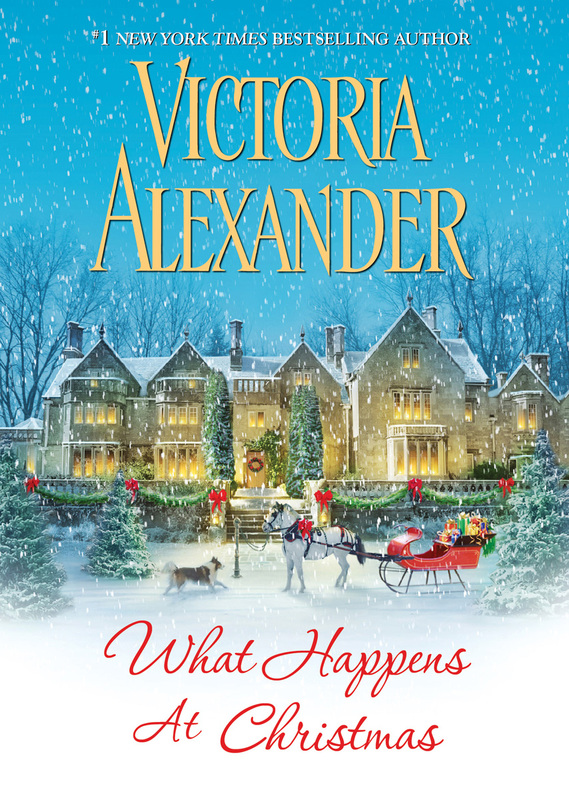 Don't worry, you still have a chance to win one of FIVE copies of Victoria's new book, What Happens at Christmas (open internationally) that we're giving away here at the Romance Dish! Plus, when you register for the event, you'll be able to watch a live stream of the chat at YouTube and submit questions and comments using a special Twitter hashtag. (You will not be required to have a YouTube account to watch the live stream however a Twitter account will be required to send in questions/comments during the event.) Everyone who registers for the event will receive an email from Author Marketing Experts on November 5 with all the information you need to make the chat live stream a fun and easy experience. On Tuesday, October 30, we will randomly select one person to occupy the virtual seat at the November 6 chat with Victoria Alexander. 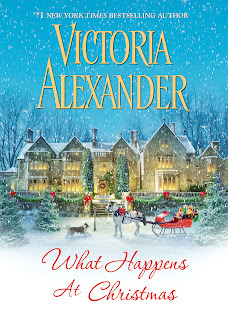 That person will also win one copy of Victoria's new hardcover holiday romance, What Happens at Christmas. The winners of the other four copies of the book will also be randomly chosen at the same time. To be eligible, simply leave a comment on this blog between now and 6am (EST) October 30. What question would you ask Victoria if you had the chance? Do you have a favorite Victoria Alexander book? Series? Like me, are you still waiting, and hoping, for a book for Becky Shelton? If you could sit down for a chat with a favorite author, who would you choose? What would you want to ask them? Do you enjoy holiday romances? Have you read any of this year's offerings yet? Do you read your holiday romance keepers each year? (I do!) Any favorites you recommend? 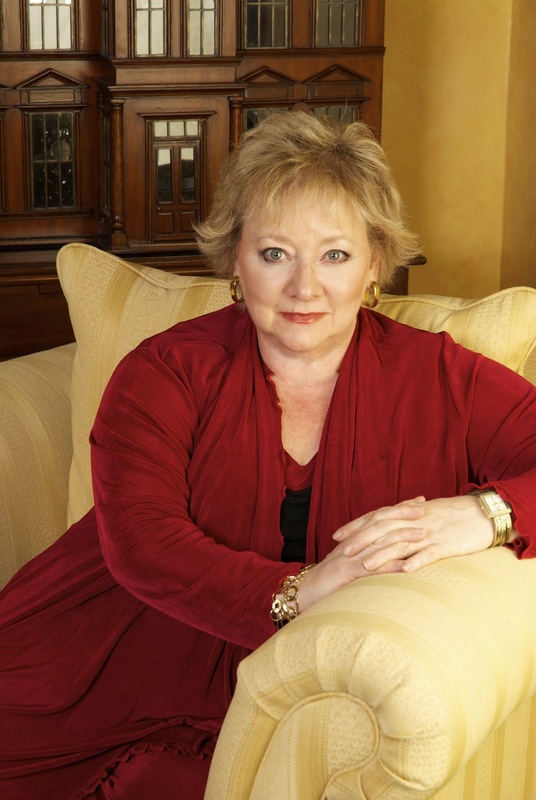 #1 New York Times bestselling author Victoria Alexander has for years been a force in the world of historical romance. This holiday season, she gifts readers with WHAT HAPPENS AT CHRISTMAS, a passionate Victorian English holiday romance filled with her signature wit and warmth. In it, a beautiful widow finds her plan for a Christmas proposal going perfectly awry. Camille, Lady Lydingham, knows what she wants for Christmas—an official engagement to a handsome prince. The prince insists on getting her family’s approval first, which leaves the lovely widow with a problem. The last thing Camille wants is for him to meet her unconventional relatives. But with the aid of a troupe of actors, Camille can pull off a Christmas deception of massive proportions. At least until Grayson Elliot shows up. A dozen years ago, their romance ended at her mother’s insistence. Now he’s back, playing absolute havoc with her scheme—and with her heart. Because for Grayson, losing Camille once was quite bad enough. Losing her twice? Unthinkable. I am already reading this one, Victoria is one of my fav authors and has been an auto buy from the beginning. I did have the pleasure of meeting her in WV some years ago, I got an autographed copy of on of her books for myself and my bf daughter. Don't enter me for the virtual seat, I am not going to have access to a computer that weekend, well not at those times anyway, I will be out of town but still wanted to give a shout out on this blog. She's one of my favorites too, Dianna. I had already been enjoying her books before meeting her for the first time at the RWA book signing in 2006. If I hadn't already been a fan, I would have been after that event. She welcomed me - an unknown reader - as warmly as if we'd been old friends and spent about 15 minutes chatting with me about books. This was at the end of the signing and the room had pretty much cleared. I'm sure she was tired and ready to call it a night but she acted like she had all the time in the world to visit with me and could think of nothing that would please her more. Oh, dear. I'm going to get banned from here - another author I haven't read. It's not that I haven't heard of her and her books do sound wonderful, I just can't seem to keep up with all I want to read. I am going to blame my daughter for part of this since she keeps giving me her book club reads and sometimes they take me forever to get through (sigh). I just can't say no lol. Kathryne Kennedy was my newest found author and I've finished all her books and I would love to ask her if she could write faster roflmao. I can imagine no author wants to hear that question and truly I wouldn't want to rush them. I also always like to ask if I could choose just one of their books to read first, which one. That's usually a hard one too lol. I like reading holiday romance books. I haven't read any of this year's offerings, but I used to read the Signet Regency anthologies. I also enjoyed Judith McNaught's Christmas anthology, A Gift of Love. A Gift of Love is one of my all-time favorite Christmas anthologies! I love Macomber's troublesome angels! I adore the Effingtons too, May! I find holiday stories so heartwarming and that is why I like to read them all year round. They are sweetest when read near the holidays because it's all about keeping warm and being surrounded by loved ones for me. I always like to know where an author gets their inspiration and the future plans for favorite characters! I've enjoyed so many of her historicals. I believe the first book I read was THE MARRIAGE LESSON closely followed by THE HUSBAND LIST. Loved the Effington family series!! Unfortunately, I cannot attend the chat. Question: I believe you started as a newspaper journalist, what inspired you to write a novel? Did you take a break from your job to write the book or did you do the book in your limited free time? I'd love to chat with Heather Graham. She's had so many different careers, raised 5 children, stayed married. Question: How she stays on top of everything going on in her life. Call story? How she got into writing? Christmas stories. I save up my Christmas stories and start reading them in October. They get me in the mood for the holidays. I especially like Curtiss Matlock's MIRACLE ON I-40. That's a great list of Christmas romances, Laurie! Miracle on I-40 has become something of a Christmas romance classic. I enjoy Victoria Alexander's stories because they are warm and have humorous events that take place. I have read many of her books, but can't put a finger on which is my favorite. Besides, I'm not at home right now to look at my fave books shelf....Victoria's book are on there, the upper shelf of my clothes closet! Paul Richard Evans writes good Christmas stories. Not romance, necessarily, but good nonetheless. PJ, you know that I'm a huge fan of Christmas books. I've read about eight 2012 Christmas releases already and am looking forward to others that release tomorrow and next week. I'm also eager to get started on one of my favorite holiday rituals, rereading Christmas keepers that I've collected over my long years of reading. Hi Victoria! I love all of your books, and enjoy the readers who do your audio books. Do you have any say in who records them? I must shamefully admit that I have never read a Victoria Alexander book... But What happens at Christmas sounds amazing & I adore holiday stories. So what better book to start with?! I try to read at least one but hopefully more holiday themed romances in December. This year I started early and reread Twelve Days of Christmas from Trisha Ashley already, I still liked it. Darn, count me in with those who have not yet read Victoria Alexander, (haning head in shame) but I do have a lot of her books on my list. I need to make some time to read them. I don't read too many holoday romances because I do not celebrate Christmas, but I just ordered Vanessa Kelly's "His Mistletoe Bride" because she is one of my favorite authors. If I could meet my favorite author it would be Jane Austen. I would show her my romance collection and ask her what she thinks about the popularity of the genre she started! I have only read a few of Victoria's books and have enjoyed all of them. I've got a bunch of others on my list. Assuming we're talking someone who is alive, I think I'd like to talk to Karen Moning - no specific question. I do enjoy holiday romances but haven't read any, yet, this year. I'm still catching up on the ones I've bought but haven't gotten to, so I don't tend to re-read them (yet!). I'm reading Victoria's Effington Family books and am wondering how she creates such a long series (it has eleven books) - did she plot it all out or did it start as a shorter series & then grow? My favorite so far is #4 'The Prince's Bride' - I loved how she developed Jocelyn's character and how she & Rand connected - plus the trip to Avalonia was great fun!